Pain is a feeling we’re conditioned to heal without fully understanding it first. This leads us to taking the wrong medication that we suffer more from in the end. Pain master David Butler explains not only what pain is but dives deeper into the psychosocial model of pain care. He wrote a book called Explain Pain where he went beyond the traditional way of explaining pain by tapping into the emotional, mental, and physical state of a person. David also provides examples that relate pain to numerous parts of the bodies, providing us the knowledge to take into consideration how we tend to view CBT as opposed to how it should be understood. 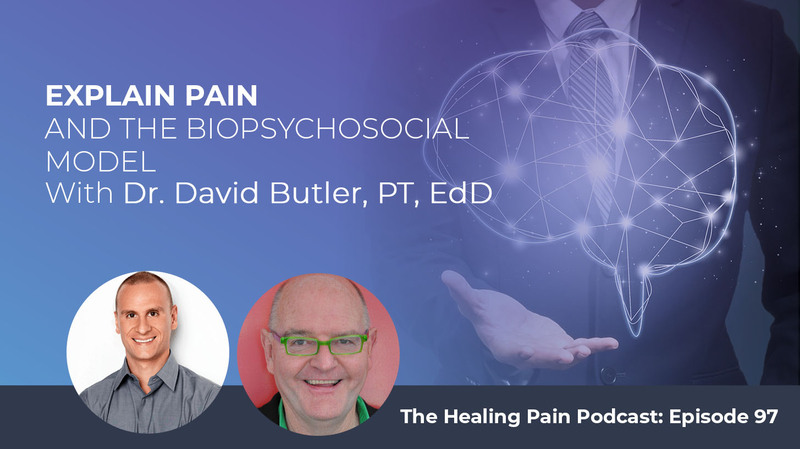 David sheds light on the importance of education as part of treating your pain by giving scenarios and thorough yet understandable reports on pain science. I created the first online summit designed to educate both the public and the practitioner about integrative pain care. If you’ve been with me for a while, you remember it was called The Healing Pain Summit. The first summit was created in August of 2015 and it was such a success that I created another a year later in August of 2016 all with the help of some very talented and intelligent practitioners. Creating the Healing Pain Summit version one and the Healing Pain Summit version two was lots of fun for me. I’ve got to connect with lots of great practitioners, but it was also a way for me to reach thousands of people in their homes all across the world. If you’re interested, those summits are still available to access. You can check them out by going to www.TheHealingPainSummit.com. As I look back on those two summits, I realize that there are so many incredible interviews, but they’re locked up behind closed doors. On this podcast, you’ll learn all about the biopsychosocial model of pain care, all about Explain Pain and why it is an effective treatment, the difference between explaining pain and traditional cognitive behavioral therapy or what’s known as CBT, why education may be the best way to treat pain, and what has to change in our physical therapy education with regard to pain science. If you’re new to The Healing Pain Podcast, let me take this opportunity to welcome you to our tribe and encourage you to subscribe to the mailing list by going to www.DrJoeTatta.com/podcasts. When you sign up, I’ll send you the latest podcast to your inbox each and every week. Let’s get started with the amazing Dr. David Butler. Thank you, Joe. It’s great to be here. Thanks for joining us. It’s a pleasure to have you here. You have a 40-year quite esteemed career of explaining what pain is to people are or trying to develop systems around explaining what pain is. Can you tell us about how you came about this concept of explaining pain and how it relates to people who have pain? It has been nearly 40 years and I like to say I’m not quite retired yet, but I’ve had a real boost in the last few years with this world of understanding brain plasticity and immunology. We’re really onto something. I’ve been playing with it, experimenting and trying education therapies and merging education therapies in with my traditional manual therapy base now for quite a few years. It came about because of the realization that people want to know. There’s a science out there which if we take a look at some wonderful stories, I call it the gifts of neuroscience, that if you can take the patients, they’ll begin to move. In the last probably ten to fifteen years, there were probably fifteen randomized controlled trials that showed that explaining pain with quality movement enhancement is the best thing out there for chronic pain. It’s far better than any medication or anything else mankind has invented. To give our readers an idea, you are a physical therapist trained first and then eventually went to pursue advanced training and a doctoral degree. How did you come about this explaining pain? How did you start to develop it? I started to develop it from a need. I was lucky in my career to link up early on with people like Professor Patrick Wall, who was supportive of physiotherapy and physical therapy. He used to call us the sleeping profession. I’ve always talked about, “Get out there and do something. There are so many of you, you’ve got the patient license, the license to touch people. You’ve got some great skills already, merge some of the neuroscience into it.” The best way to merge it was explaining the stories to patients as part of therapy. It’s interesting because our profession or many professions don’t think of educational therapy yet. We don’t quite take that on. I certainly found when I went and did an educational doctorate that there are these two big silos. One was health and one was education, and each didn’t mix, but there was so much that could be done. I was probably self-taught early on. I’ve always liked talking to patients, telling stories, then mixing up and meeting with some colleagues. Louis Gifford and Lorimer Moseley were particularly helpful. I’d probably develop a taxonomy of pain stories that I’ll be publishing with Lorimer Moseley shortly, over a hundred or so little stories and nuggets that can be taken to patients sometimes as emergency analgesia, but other times for longest stories that can help them develop significant and durable conceptual change. CBT is obviously the most well-known of the psychological methods, and I think explaining pain and CBT both offer a lot to each other but they’re still to merge. There are some issues with CBT though because one of the features of CBT that is taught in the UK, perhaps in the US as well, is that if you have pain then CBT can help you function better but then they don’t think can you change pain. One thing we believe firmly and the data shows, is that we believe that not only can you function better, but pain can also change. There’s a fundamental turn that is linked to that to take it on. That is we should be considering pain treatment, not pain management. I and my colleagues think the word pain management is a cop out. Pain is a biological event. Everything in biology changes. If we’re good enough, pain can change too. With CBT, if thoughts and beliefs can take you to a pain state, then surely thoughts and beliefs can take you out of it as well. That’s a great point because it’s fascinating to talk to another physical therapist about this. When you hear physical therapists, most people are thinking they’re going to talk to you about exercise, movement, strengthening muscles or something like that, but you’re talking about actually how your thoughts, your beliefs, and your emotions affect your brain and how it can affect your pain. How they can affect your pain, but not only pain. If we can take on the fundamental concept that pain is an output of the brain, a construction of the brain, a homeostatic system, there are a number of other homeostatic systems as well which it can affect and that’s going to be not only pain but immune, endocrine, sympathetic, respiratory, motor, emotions, cognitions, among others. There’s a big field there. This is part of what keeps me excited after the 40 years in the game. You pretty much named almost every system in the body. We need to know about these systems, Joe. 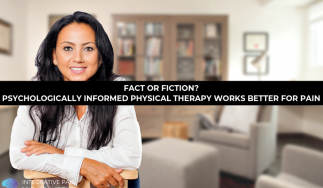 They all bring a remarkable narrative with them by bringing an understanding with them and it powers up everything else we do in physical therapy, which is evidence-based. Let me pull one of those systems that you mentioned. Let me pull endocrine. When traditional physicians or traditional practitioners hear endocrine, they think of hormones. To a traditional physician, you would say, “To affect hormones, I might have to give you hormone replacement therapy,” or some kind of drug. How can explaining pain affect our neuroendocrine system because it’s two combined as one, correct? Yes. The endocrine system is an output system which helps us cope, adjust, learn. It will simply be turned on. There’s a lot of danger in me, which can arise from many domains. It’s not only whether you’re injured but how you are treated, ISIS, elections in America, there’s a lot of danger out there. The circumstances or the context can create a stress response, a neuroendocrine response, which is part of that, which will lead to altered glucocorticoids, which have an effect. This has been known for ages and there are lots of stories out there. If I was to take that to a simple story, it would be when you’re in trouble, one of the systems which can come in and help you is the neuroendocrine system. What it does for acute stress is it powers up systems you need and shuts down systems you don’t need. You don’t need when you’re stressed, if you’re being challenged, mugged, or whatever. You don’t need digestion, you don’t need reproduction, you don’t need healing, you don’t need high-level thoughts, that’s okay but if the stress persists for a long time, then you will start to get these changes that we see so common in people with chronic pain or cognitive changes of tissue healing, of the beta changes or gut changes. I’ve always been interested as a therapist because for example, in chronic back pain, one of the most common comorbidities is gut problems. They’ve always been treated as two different things. Very often, they’re going to arise from the one essentially stressed state which is caused by two different systems. There are a lot of people who talk about gut health and nutrition on my summits, I talk about it myself. I am trained in nutrition. I’m a certified nutritionist. I think it’s important and there are some people you can go to the gut first to start the healing, but for a lot of people, especially people who have chronic pain, you have to go to the other areas first. Your point of the brain and people’s thoughts are the places where you have to go to start the healing process. The gut is secondary to it. The world has been slow to take the trip up to enhance therapy and educational strategies. I’m certainly not trained as you are there, but we certainly would see that people deal with gut pain. Our view here and indeed the science that we take to explain pain from would be that we’d see chronic gut pain as broadly similar to chronic back pain. There could be processes in the target tissues, the gut or the back, processes in the neurology, changes in the central nervous system, and changes in the other output systems which can come back and create a cycle where the gut issue is going. Still in explaining pain, I’ve been thinking, the world has been slow to take the trip up the air from neuro into the glory above and see what wonders and majesty there is to enhance therapy and to add educational strategies. You’re an expert in the nervous system. Can you explain to us how someone with chronic pain, someone who has pain more than six months, what are some of the changes that begin to happen in the nervous system? Why is it that a sensitive nervous system is more likely the cause of their pain versus let’s say a joint or muscle-tendon or other things we can think about? It’s fairly well-accepted in science that over time the essential pathophysiological processes for a pain state live up into the representation of the muscle, the tissue, the injury. That could occur at spinal cord or through a ganglion, but certainly in the representation in the brain as well. This is broadly a way in which the human tries to protect itself. It calls upon higher level protective strategies to defend and depending if you want to use a gene analogy, to pass on your genes to survive and live. If protection involved things like expanding the representation of a body part in the brain, then so be it. That’s a great thing as long as it doesn’t stay for too long. We have many ways to protect ourselves and of course it could be more useful or could ultimately lead to perturbations of any of the homeostatic systems, changes in respiration, changes in cognition, changes in the sympathetic system, change in the endocrine system, all of these protective systems which are great for more acute trauma. If they’re kept turned on, if they’re kept edgy, they may have perturbation in those systems that we see later on. If it’s a perturbation in the sympathetic immune, you might see complex regional pain syndrome, perturbations in the motor system, all muscle imbalances and the like. Simply they start from human protective elements against a range of dangers out there in society. Essentially what you’re saying is they all start from the brain basically and then the brain can send a different output to the body depending on who you are and what’s your physiology or genetics are because you mentioned some of those motor outputs, and some could be sympathetic outputs. Motor people, they’re saying, “Motor means I can have weakness or I can have a muscle imbalance or one muscle is tighter, one muscle is more flexible.” What does sympathetic really mean though? It gets complex because these homeostatic systems that we see perturbed will never be turned on alone. If you’ve got a sympathetic alteration, which could be more or less adrenaline being bought out or could also involve a change in the amount and kind of adrenaline receptors in the axon or of neurons, you will nearly always see it linked to endocrine and immune changes as well. In the simplest sense, in the more acute sense, we see the sympathetic nervous system perturbed and turned on. It’s probably one of the fastest systems turned on to help us deal with stress. You see the initial blushing and the redness, but of course, if our brain weighs the world and decides the sympathetic nervous system should be used as a prime defender and that uses that so hard and so long, the system itself, its apparatus can become perturbed and you start to get blood pressure changes, skin changes, plaque in arteries, anxiety and panic attacks. It does explain the pain story of why that might have happened. If we go back a step because to the motor system and we see, for example, a characteristic of motor change after a persistent threat of forward head posture and these muscles get tight and all sorts of hotspots in them and this is weak, a decent therapist shouldn’t start to strengthen this and stretch that and do other sorts of strategies. If they take it a step further, go deeper to try and work out what was it that made that person adapt that posture, what was that person trying to protect from, then they’re getting into a deeper biopsychosocial approach and they’re also getting into the need for a narrative or story to explain that. The social side, which is often missed in our health profession, but I always tell people if you’re with a patient and that patient is telling you about their pain state, if you can suddenly realize, “This is not a problem just with this person. This is a problem in society as a whole.” Then you’d get the social part of biopsychosocial. There’s the other framework, the biomedical framework, the find it and fix it. By the way, whenever we let go because there are some fabulous pieces in biomedical thinking, and I would say many of your audience, there would be some who would not be alive today if somebody didn’t have a detailed biomedical hunt for pathology. Biomedical thinking will fit into bio psychosocial thinking, but bio psychosocial thinking will not fit into biomedical. The key thing, Joe, as I’m sure most of your listeners will know, is that when something becomes chronic and when the pain state has multiple causes and also the pains on what a person thinks and does about it, then the biomedical singular hunt for something will not work. You need to go to a more biopsychosocial, a wider framework to address that. It’s not just chronic pain, it’s chronic obstructive airways diseases, it’s chronic diabetes, it’s a whole range of the chronic states. I often say biomedical thinking will fit into biopsychosocial thinking, but biopsychosocial will not fit into biomedical, so we biopsychosocialists welcome the biomedics. We say, “Come in. Join our club. Give us your good bits and we’ll help enrich your own practice with biopsychosocialism.” It sounds a bit Marxist, doesn’t it biopsychosocialism? It’s a very complex word. To boil it down, what you say is that there’s no one way to necessarily treat or cure pain. It may be different and unique for a particular individual. There’s no recipe. It’s got to be reasoned to get the best out of the person. It’s an individual experience and that’s the first thing we have to respect. That brings me to my next question, which ties into your book Explain Pain and I know you have a new version of that book coming out which is called Explain Pain Supercharged. How is it that every person’s pain experience is unique to them? Two people have the same injury or disease process or trauma or whatever it is that is causing their pain, ultimately pain and the Everybody is different from the moment they are injured.pain experience is unique to you as an individual. It will never ever be the same for each person. I think that’s it because everybody has an injury in a different context. Everybody has an injury with different memories, concepts, experiences, predictions for the future at that time. When we see two people with the same injuries, it will never be the same injury because of these other processes which have occurred, the framework that that injury has occurred on. It then goes on. It also depends on a whole range of things. Who you meet, who treats you, does that person have adequate skills in relation to your own concepts about your pain state? Everybody is different from the moment they are injured. Everybody is different from the moment before they were injured I look at this chronic pain epidemic, we realized 100 Americans have an ongoing pain state. We realize that chronic pain in America costs five times what it does to run the wars America is involved in and Australia too. It’s a horrendous epidemic and I sometimes think, what’s the answer? For me, it’s almost a preemptive hit back in schools, back before people have pain, education and industry and schools about pain that it’s used in all the damaging thing, that it will nearly always get better, that we always have pain and that it’s a normal part of life. That’s a long-winded way of answering your last question. We’re all different but we need to go back early on in our life experiences to do something about this epidemic. A lot of people log on to my summit, physicians, physical therapists, chiropractors, health coaches. Some of them are very familiar with their concepts and some of them are just starting to hear them. What are the key principles that practitioners need to be successful in explaining pain to patients? That is something my colleague, Lorimer Moseley, and I have worked together a lot. When we wrote Explain Pain, we were essentially telling the story of the neuroscience in a language that patients and therapists and health professionals would get. Then, we realized a little bit later that we needed to do more on how to translate that information over which is essentially conceptual change theory, how do we change concepts in our patients as well. That’s merging the education element in with the neuroscience. There are a few things there. To be good at it first, you’ve got to have a biopsychosocial approach; the nice, wide biopsychosocial approach. There are also competencies that health professionals need. You need to be first of all biologically literate. Biologically literate these days means an understanding that neuroscience is changing at an incredible rate. The old systems we learned about nociceptors and stuff is changing. We have to be neuroimmunologists. If we don’t take on the immunology and realize that at least 50% to 80% of the brain cells have gotten immune function, then we’re missing something. The glial cells have immune function and critical in learning, health, and sensitivity. For a health professional to be good at it needs to have what we call an emergent scheme in their brain, an emergent neurotag in their brain. In another way, if I can contrast that with a linear way of thinking, which someone who’s thinking linear ABCD will often have a singular blame for something. If the professional has an emergent framework, which means that they can think collectively and realize that many things come together at the same time to construct this output of pain. If I haven’t got that, I think you’re in a little bit of trouble. It can be taught. Indeed, one of the things we teach our patients is to try and give them this ability to think collectively. To give you a distant example, someone has been badly burned and then three years later they have a chronic pain state. I can fully understand how that person would want to blame the burn for it and what happened at the burn? Three years later, there will be many other things coming in to help construct this pain state. They’re coming in together, working together collectively to create the pain state. This emergent framework, this thinking collectively is a real necessity for thinkers. There are lots of others who are knowing common targets to therapy too. If I was to list some of the common concept targets for education, first of all, the difference between nociception and pain. Nociception doesn’t have to hurt. Pain is a brain construction. The key concept targets that pain is distributed in the brain so that when we have pain, there could be maybe a thousand areas of the brain engaged at the same time, which says that there are many things which can come and influence it and it underlies a pair of context. We are bioplastic is the word we used that underlies incredible changeability and potential that we have. There are many coping strategies for people to be aware. I’m sure many of your co-contributors will have many ways to deal with the pain state. If we link it all together it will be absolutely wonderful. Yes, there are competencies that people need to have. Finally, we could all do with a little bit of educational psychology. Teachers are taught how to teach and here we are pushing education as therapy. The education we’re after here is not the education that we all have when we were youngsters when we learned new things. The kind of educational psychology we need here is the conceptual change world because people with pain come in with a lot of existing beliefs and knowledge ideas. The educational strategies essentially come from the research field of conceptual change. There is one issue there. Sometimes with conceptual change, it requires a little bit of conflict. Many of our colleagues don’t want to engage in conflict. It can be done nicely, it can be done beautifully, can be done with stories, it can be done implicitly with people reading, but to get to this epidemic in society, the conceptual change, the loss of a bit of conflict is often necessary. It’s a great point at the conflict part. I have had conversations with other practitioners. A couple of examples that come to my mind, if someone has an autoimmune disease, how do we explain pain or pain education or pain neuroscience, whatever you want to call it? How can it help that? If someone has fractured vertebrae, they were in a car accident, they fractured their spine, how is your conceptual model going to change that basically? They’re valid questions. Explaining pain is for all pain. 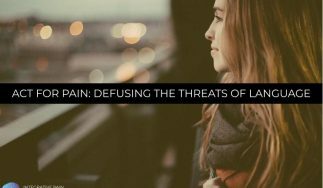 What that has done is it has led to a philosophy that explaining pain is something for the person with chronic pain, not acute pain or even subacute. Our view is that explaining pain is for all pain. In fact, I don’t like to divide acute and chronic. I don’t know where that came from. I find it difficult. We say that education is for both acute and also as I commented before, even as a preemptive hit on pain. If someone’s got a fracture, you’d be doing other things as well but there’s no harm and certainly would be advantageous to discuss the pain they’re experiencing to weigh up why they are hurting. If I may expand on that a little bit, there’s a fundamental thing that I feel that’s kept me going in the last few years. It’s the ability along with my colleague, Moseley, to put a lot of complex neuroscience under a simple formula and it’s called a DIM SIM formula. If I may say it, we feel competent to say that a person will have pain when their brain weighs the world, judges everything and works out that there’s more danger out there than safety. Equally a person will not have pain when a brain weighs the world and judges there is more safety out there than danger. The trouble is danger and safety hide in hard to find places. The dangers out there which could be constructing a pain state could be ranging from smells, memories, the things people say, the things they say, their own injuries to the body, the people they hang around with, the places they meet. If there are, let’s say, a thousand pieces of the brain engaged in a pain experience, you can understand there could be many dangers coming in and constructing that. 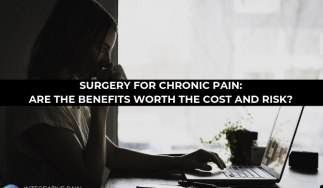 They will still be there and around in an acute pain state and I believe you can deal with that early, you may well be preventing or minimizing the chances of a more chronic pain until later on. What you’re saying is when we’re talking about the experience of pain, you can bring in smell or sight or something that you heard. Those are all receptors that come into your brain basically. The brain has to take in all that information, do something with it and figure out whether there is safety or whether there’s danger. One of the things I tell my patients is that ultimately, pleasure mutes pain. You can find a way to increase the pleasure in your life. A lot of times those danger signals start to really die down. If those danger signals die down, you can’t have pain. A story I would tell my patients would be that when they do these fancy brain maps of people in pain and people in pleasure, it looks reasonably similar, so they could say crudely that pleasure uses similar networks as pain does. You could argue it’s exercising areas of the brain using pain. It takes it away from what we call the pain and the neurotag. That would be an example of a very simple explain pain. In the US, we’ve had a good awareness around opioids and the fact that we have an opioid addiction problem in our country and it’s overprescribed. We finally have the government saying, “They may have their place, but they don’t have such a great place for those with persistent pain.” Where do you see pain treatment go in the next twenty years? I often have that discussion with my colleagues. First of all, I like how you used the word pain treatment. It’s great that this opioid abuse has come to light. It’s not only in your country, it’s here as well too, that we have more deaths from the prescription pad than there are illegal opioids. Surely there will be some more responsibility taken for the opioid overuse. There are those of us who are out there presenting a different thing. For example, if there’s no heavy drug, what is there? It’s up to your audience to say, “There’s a lot of other things that we can do that are gaining evidence and don’t have the same side effects.” I’d obviously put education and movement and all your other contributors like diet in there as well. We need to stand up and be heard. I’ve got a little bit more confident. I must admit, ten years ago, I was thinking, “That’s going to happen.” Then you see big pharmacology is moving out of research and development for chronic pain because the last big one here was with Gabapentin called Lyrica there. It says, “Who’s next? Who’s going to take its place?” I must admit, I get confident when I see, for example, it’s getting a bit easier to get research money for education and non-pharmacology-based research from government bases. I still recall the first Explain Pain course I ever did in Sydney in 2003 with Lorimer Moseley. We publicized it but only nine people turned up. I said to Lorimer, “This is not going to go very far.” He said, “Stick with it. They’ll get it.” We now have the great honor. We might go around a small Australian city and a hundred people will turn up but they’ll be from all professions coming in. It’s long now gone out of the physical therapy world and it’s a very multidisciplinary thing which I love. I took your Explain Pain course and it’s a wonderful course. It’s starting to pick up more momentum in the United States and I’m sure it’ll continue. Can we talk about the physical therapy profession and this whole pain epidemic? I have done a lot of phone calls and emails and some urging of the American Physical Therapy Association, our professional association here in the US, to say, “I do think that physical therapists probably are the key clinicians for turning our persistent pain epidemic around.” I realize that there’s not one source of pain and there are a lot of different reasons for it. Why are physical therapists uniquely trained to take this epidemic head on and probably change it? Years from now when we look back, I do think that doctors and physical therapists here in the US probably will be the ones that turn the epidemic around. You’re right there with a few provisos. I do think our education has to change. For example, at the undergraduate level, there should be full two long subjects on chronic pain and acute pain treatment. I don’t know if that’s that prevalent out there. I know it took me a long time to get our university here to take on a 180-hour clinical pain sciences course ten years ago. I know there were a few others that are being set up. That has to happen at the undergraduate level first. Secondly, we have this problem out there where Explain Pain is attempted to be delivered at the same time as more biomedical approaches. Without picking on one, in particular, I will say dry needling. I don’t have any problem with dry needling or the Graston technique as long as it’s put in a big framework of a biopsychosocial approach and that it’s a part of an overall recovery. Explain Pain becomes quite difficult if it’s not put in that big framework because if you’re explaining pain, you are essentially saying to somebody, “A lot of your pain’s in the brain.” Then you go on and do something which is more biomedical by itself let’s say a needle or some technique. It’s a bit confusing for the patient. It’s a bit of a problem and they probably won’t quite get it. This is where biopsychosocial philosophy and thinking has to come in very early in our education to make this work. I’d also say too for our profession, we are only just getting a grasp of the power of education. Lorimer and I sat down. We’ve written a taxonomy of pain stories of a hundred strong and each time we meet and talk, we say, “I wish I was using that story five or eight years ago. I wish I could use that.” We’re still growing with Explain Pain. That also leads to a problem, because anything a little bit new can easily be knocked off. People say, “Yes, I tried that. Yes, I gave them stories. That didn’t work, so I went on and did this.” I ask people to be careful with it. I think there are sixteen randomized controlled trials now showing its efficacy. Sixteen, and probably four. I’m aware of it still being done. We now work in different populations, in different ages, for different problems states as well too, but it still needs a lot more. The good news from it though is that all the RCTs show that it works and if we look at the number needed to treat statistics, they’re certainly far better than any of the heavy medications which are currently still the mainstay for pain treatment in your country and mine. Dr. Butler, people want to learn more about you and some of the courses you offer. If they’re looking for more information about exactly what Explain Pain is, can you tell me on summary where they can find you and your website? They can come to our website, www.NoiGroup.com. There are lots of links there and lots of video clips. They can come on to NoiJam.com where we post Explain Pain stories nearly every week. I’m coming over the US at the end of the year, around election time, which I’m a little bit scared at election time because the world is not sure what is going to happen. I’ll be over there doing some big seminars in Philadelphia and Seattle. I always love coming over to the US and getting inspired again and seeing what people are doing. I’m around. I might have been here for 40 years, but I’m still excited about it. I think I’ll be here for quite a while. If you’re in the US, please check out Dr. Butler. Philly is in December, is that correct? Yes. I’m doing a course there and this is another advance to Explain Pain. I’m doing it with Lorimer Moseley but also with Mark Jensen who some of you might know a Professor of Psychology in San Francisco. Of course, he’s a world expert in hypnosis. One of the things we’re doing in our strategies to develop Explain Pain is whether it will be better if we can induce a state of hypnosis first and then use our education. There’s a number of other strategies, motivational interviewing that can be used to help hypnosis, CBT. I’m looking forward to that. If you enjoyed this, which I’m sure you did, there are lots of great strategies and tidbits. Please hit the link so you can share this out on Facebook or you can share it out on Twitter. I want to thank Dr. David Butler for joining us on the Healing Pain Summit 2.0. It’s been great to have him. We will see you on the next interview. David is a clinician, an international freelance educator, an Adjunct Associate Professor with the University of South Australia and an Honoured Lifetime Member of the Australian Physiotherapy Association. His professional interests focus on the integration of neurobiology into clinical decision making and public and professional education in pain, stress and performance management. Food, wine and fishing are also research interests.